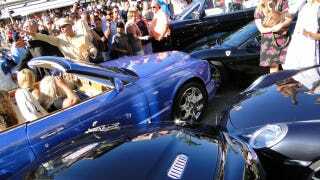 Only in Monaco would you find a Bentley Azure T that's managed to plow into a Ferrari F430, damaging an Aston Martin Rapide, a Porsche 911 Carrera S and a Mercedes S-Class in the process. Monaco's body shops must make their casinos look like convents. Cela va droit à buff!